A non-shrinking, non-slumping ready to use ultra light filling paste. Can be sanded and after 30 minutes can be overpainted. 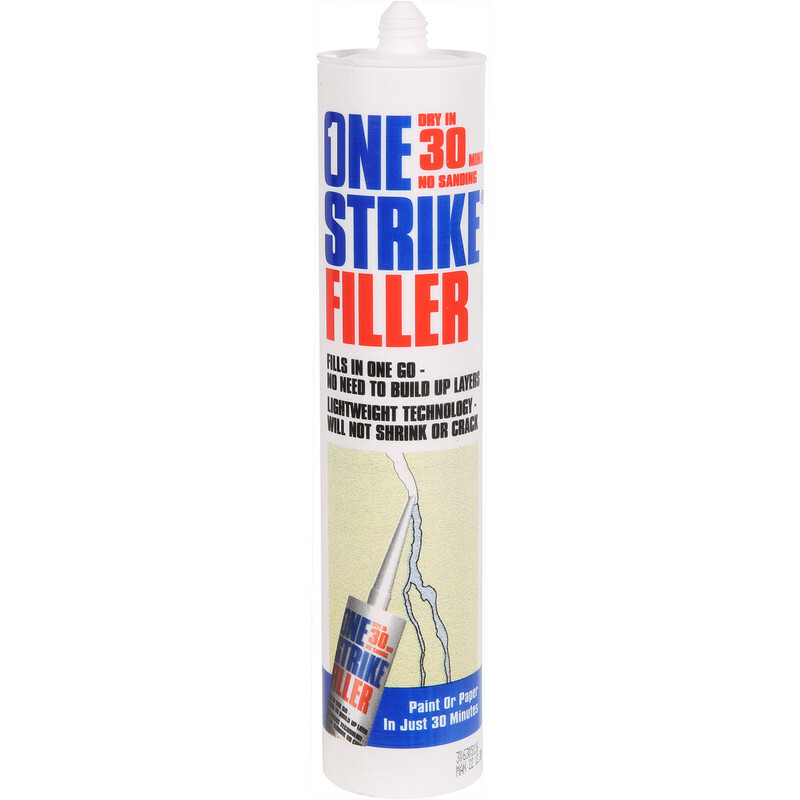 One Strike Ready Mixed Filler 300ml is rated 4.1 out of 5 by 11. Rated 5 out of 5 by ninjagran from Great for walls and ceilings to fill cracks Great stuff. Can even rub it into the cracks with your fingers, then wipe it over with a damp cloth and job done. No nasty smell, no need to rub down. Rated 4 out of 5 by Midnight from One strike filler Does what it is supposed to do on application, to early to comment on long term performance. Rated 4 out of 5 by kenaimur from Almost perfect I am using it for a year now. The firs caulk which does not crackle after being painted over. The only caveat, very difficult to spreaded/smoothed. Perfect for small areas, very time-consuming. Rated 5 out of 5 by MICO from Great product Great product. Easy to use. Rated 5 out of 5 by Phil already used from Easy to work with and versatile Easy to use filler. Dries quickly and can get a really nice finish. It can be used in big gaps too, but if you're filling in big holes, it does shrink a bit, so you'll need a finishing skim over after. Rated 3 out of 5 by Jackthegripper from It's okay Last year I was using the SX Siroflex plaster filler. This was a much better product and I'm disappointed it's no longer available. The One Strike filler is a lighter and less substantial product that does adhere as well as the Siroflex when applied. It's okay but not great. Rated 1 out of 5 by Old Badger from A POOR FILLER This is basically a fine filler in a tube to use with a skeleton gun. Try to fill cracks and smooth and it simply comes out, no adhesion and when you gently rub down it comes out. OK so it says no sanding, but you do at times have to lightly sand, and this product does not stand up to even the lightest of touches.